This is an edited transcript of the panel discussion at the Festival of American Fiddle Tunesl, Port Townsend, Washington, July 2, 1986, as a part of the Washington Fiddlers Project, funded by the National Endowment for the Arts, and initially administered by Centrum Foundation. A version of this previously was published in The Washboard, the newsletter of the Washington State Folklife Council. The Washington Fiddlers Project was started to document the traditional fiddling of the Pacific Northwest. 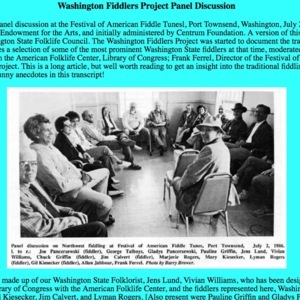 This panel discussion includes a selection of some of the most prominent Washington State fiddlers at that time, moderated and conducted by Washington State Folklorist, Jens Lund; Alan Jabbour from the American Folklife Center, Library of Congress; Frank Ferrel, Director of the Festival of American Fiddle tunes; and Vivian Williams, chief field researcher for the project. This is a long article, but well worth reading to get an insight into the traditional fiddling in Washington and where it came from. There are some great stories and funny anecdotes in this transcript! 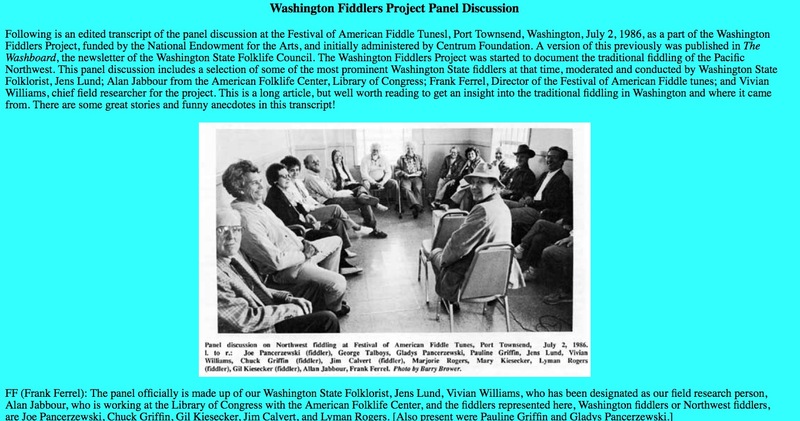 “Washington Fiddlers Project Panel Discussion,” Square Dance History Project, accessed April 24, 2019, http://squaredancehistory.org/items/show/932.